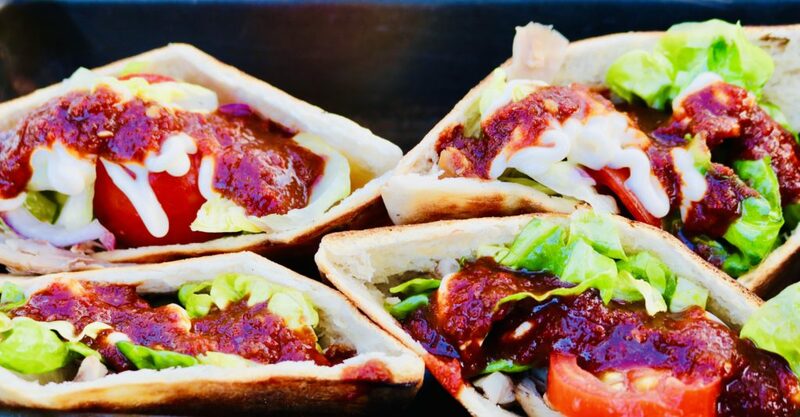 ChillaxBBQ Chicken Kebab | Is Life a Recipe? Yep, I went for it today for Marissa Knibbs’ birthday party. 80% new dishes were spun up, including this beauty. ChillaxBBQ Chicken Kebabs. Pretty simple to do actually, but it’s all in the sauce. That’s the knockout element to this absolute spanker of a dish. It’s quality in a pita. A tube of Japanese mayonnaise. A good pinch of sea salt and cracked black pepper. Put all the above ingredients for the sauce in a pan. Get that on the heat and bring to the boil, and then to a simmer for 5 or so minutes. You are muddling the flavours together basically. Once that is done get our your hand blender and whizz that up until there are no lumps. This is your chilli sauce for the ChillaxBBQ Chicken Kebabs. Squeeze over some Japanese mayonnaise. That is that. There is your ChillaxBBQ Chicken Kebabs. I placed these into a bread tin for serving. This is yet again an ingenious single serve BBQ dish from the crew. Believe me, this is knockout. We had requests for more and more. Hell yes, this is a cracker. Get on it now folks, you will seriously ENJOY!!! No Replies to "ChillaxBBQ Chicken Kebab"